Phase 1 of the contracting process is Planning for Procurement. Acquisition Planning is the process of identifying and describing requirements and determining the best method for meeting those requirements. An important step in acquisition planning is identification of the acquisition team. For a major acquisition, participants normally include the Program Manager (PM), Program Contracting Officer (PCO), technical experts, logisticians, financial and legal personnel. 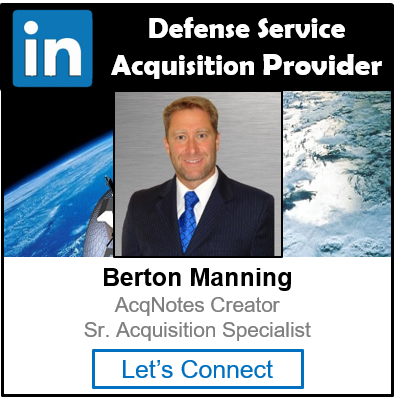 Acquisition planning focuses on the business and technical management approaches designed to achieve program objectives within specified resource constraints and the procurement and contracting strategies necessary for implementation. Defining Requirements: Defining requirements is the first step in the procurement process, and it is the Program Office that identifies, defines, and details their procurement needs. Organizational Conflict of Interest (OCI): A COI is a situation in which a person, who is in a position of trust, has a competing professional or personal interest to the Government. The PM and PCO must identify these COI’s and manage them. Market Research: Before initiating a procurement action, the Program Office must perform due diligence in assessing what products or services already exist. The purpose of market research is to ensure that the “best value” is identified for procurement actions greater than $100,000 throughout the acquisition process, from development throughout the lifecycle of the system. Acquisition Planning and Strategy: The principal purpose of acquisition planning is to ensure that the Government meets its needs in the most effective, economical, and timely manner. An Acquisition Strategy (AS) and Acquisition Plans (AP) achieve these objectives by focusing on competition and the acquisition of commercial items or non-developmental items. Contract Planning Conference: A Contract Planning Conference (CPC) is the forum in which key members of the program’s Acquisition Coordination Team discuss major issues that need to be addressed early in the procurement process. Other than Full and Open Competition: Under certain circumstances, the Government may solicit offers from one or more sources and award contracts to those sources without providing for full and open competition to ensure that the Government meets its needs in the most effective, economical, and timely manner possible. Request for Proposal (RFP): An RFP is a solicitation used in negotiated acquisition to communicate government requirements to prospective contractor and to solicit proposals. Source Selection Plan (SSP): The SSP specifies how the source selection process will be organized and conducted, and describes in detail how to analyze and evaluate the proposals and ultimately select the winning offeror(s).